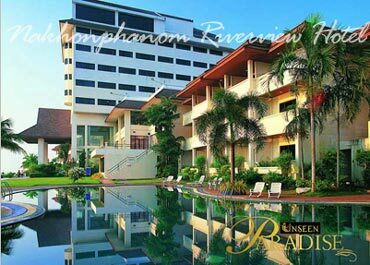 Experience a pleasure of life by the Mekong River at Nakhon Phanam River View. 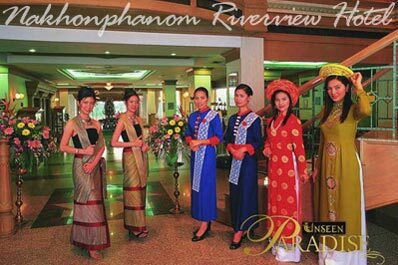 Nakhon Phanom, the land of historical heritage and gateway to civilization, Is blessed with charming old customs and traditions, intricate arts, and word-renowned ancient sites. 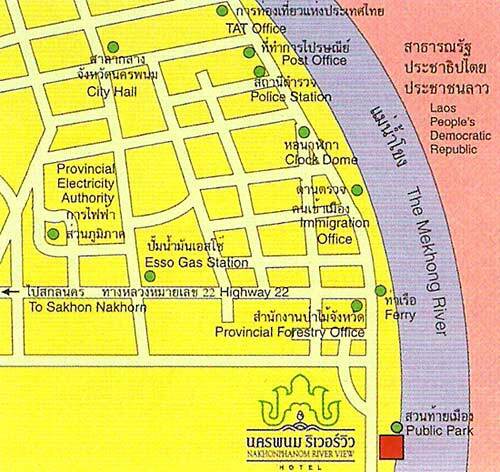 Considered the business and tourist hub of the upper north-east Thailand, Nakhon Phanom is an exceptional tourist destination, boasting all the essential facilities and services to provide both local and international visitors with maximum comfort and convenience. 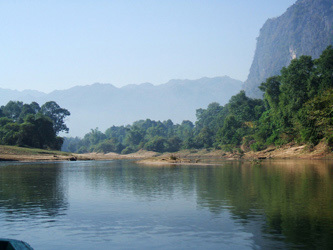 The town is opposite to Thakhet in Lao Khammouane province - the land of limestone hills, cliffs, caves and streams, and the gateway to Vietnam. 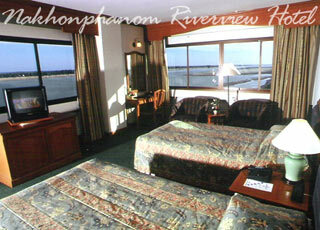 The hotel sits right on the Mekong river bank with views to Lao side. Sun rise view over the Mekong river from Lao side. 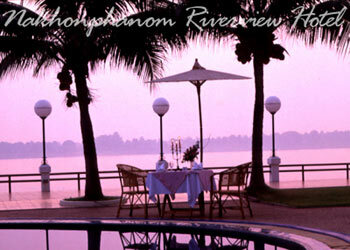 Relax in the garden or over the pool with the Mekong river as back ground. With en-suite facilities, all 122 rooms (suites, river view, superior and standard) are handsomly designed and thoughtfully appointed to satisfy even the most discerning of businessmen and tourists. 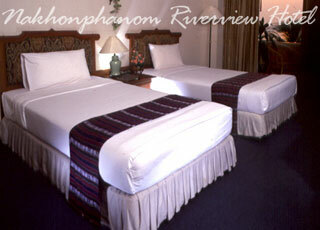 All guest rooms are fully furnished, and provided with good facilities. Offers you an incredible variety of Indochinese dishes, all prepared to perfection. Here you can also relish your favorite drinks to the accompaniment of soothing music, as you relax and enjoy the congenial atmosphere of this increasingly popular eating venue. A culinary experience you will never forget! Elegant function rooms, which are ideal for seminars, banquets and conferences are available. All large, medium and small-size rooms feature modern facilities and audio-visual equipment can accommodate from 40 to 600 guests. Savour a selection of delicious international dishes round-the-clock in the cozy ambiance of Natheethong Coffee Shop, offering superb views of the Mekhong River, this outlet is a favourite amongst old and new guests alike. At Romthong Lobby Lounge, you will enjoy both Thai international music. 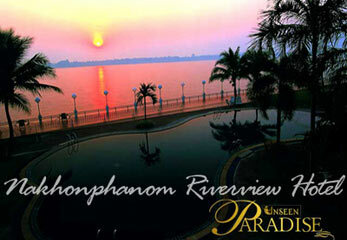 Sip your drink of preference while taking in the splendid view of the Mekhong River by night. With a large karaoke room, featuring a state-of-the-art sound system, this make-your-own music joint provides a whole collection of Thai and international songs for the ultimate leisure experience. 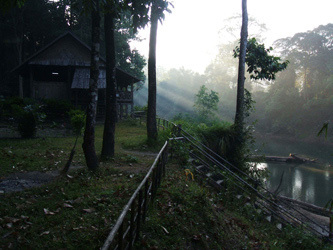 To arrange a trip for your private group to Khammouane province in Laos starting in Nakhon Phanom, use "send inquiry" page to contact Trek Thailand team.